1. Sift together flour and baking soda; set aside. 2. Cream sugar, vegetable oil, eggs and vanilla until light and fluffy. 3. Gradually add flour mixture, a third at a time, alternating with the buttermilk, until fully incorporated. 4. Turn the batter onto a 12-by-18-inch baking sheet (jellyroll pan) that is lined with parchment paper, buttered and floured. 5. Bake at 350 degrees F for 12 to 15 minutes or until the cake springs back when touched lightly. Set aside on a rack to cool. 1. Melt chocolate slowly, in a microwave or double boiler, until warm. 2. Whip cream to soft peaks. 3. Make a small well in the cream, pour in the chocolate, then gradually whisk it into the cream. 1. Cut two 8-inch circles from the cake. Place one on a serving plate and put an 8-inch ring, such as a springform pan without the bottom, around it. 2. Select 10 to 12 uniformly tall strawberries and cut in half vertically. With cut side touching the inside of the ring, arrange the berries close together around the top of that layer. Cover the rest of the cake top with the remaining whole berries. 3. Spread the filling over the berries, reserving 1/2 cup. 4. Top with remaining layer of cake and spread reserved filling over the top. 5. Refrigerate cake at least 4 hours or overnight. 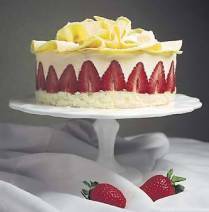 To unmold, run the tip of a paring knife around the top part of the cake (avoiding the berries) and lift the cake ring straight up. 1. Melt chocolate and spread on the back of a baking sheet. 2. Refrigerate until just set, 1 to 3 minutes. 3. With a spatula, scrape the chocolate into sheets and fold with hands to form shapes resembling flower petals. 4. Place these on the cake and refrigerate until set. incredible cake, a recipe i've turned to many times to impress. there are two tricky points. i would add that you should make the top cake circle a little smaller than the bottom circle, and the whipped cream-chocolate fold is challenging. the cream can't be cold, or the chocolate seizes into clumps. the chocolate can't be to hot, or it deflates the cream. when you get it right and the strawberries are at their height, it's a springtime mind-blower. I had a little trouble with the whipping cream (I had to make 2 late night trips to the store! ), but this cake was definitely worth the effort! This cake is wonderful....I also had a problem with the filling. I quick tempered the chocolate and folded it into the whip cream, which made it clumpy and liquid like. I also had to make another trip to the store for more chocolate and whipping cream. I had to melt the chocolate in the microwave and let it sit out at room temperature before I folded it into the whip cream (which can not be cold). Remember this before you make this cake. Other than that it was wonderful and absolutely priceless in looks.